UPDATE: See the latest Brightest Headlights rankings. What do we ultimately want from a set of headlights? We want to be able to see something in the dark that is as far away as possible, and be able to make it out clearly. While there are all kinds of ways to determine the best way to do this, ultimately how well the average person sees something is related to how many photons (light) are being reflected off the object and back into their eye. The closer you are to an object, the more reflected photons you’ll see, but if you can’t change your distance, the best way to see more photons is to throw more photons at the object. How do we do that? Brighter lights. And many will argue that it doesn’t matter how bright the lights are if they’re not aimed correctly (this is true), it is usually fairly standard, and only thrown off by odd combinations of light bulbs and headlight enclosures. As such if you want to see well, you want bright headlights. How much light a light bulb puts out is usually measured in lumens. Often a power rating will be given in watts, this is an indication of how much energy the light uses to shine, but some manufacturers will indicate that their light bulbs shine as bright as if it were a 110W lightbulb, while only drawing 55W. Lumens is a more objective measure of a light bulb’s brightness. How the color temperature of your lightbulbs affects how well you see can be a bit subjective. A whiter light seems to be favorable for most, helping to increase the contrast, especially of darker colors. 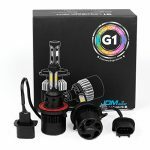 It’s also the way the industry is tending towards, with performance halogens, HID and LED bulbs all favoring a whiter color. 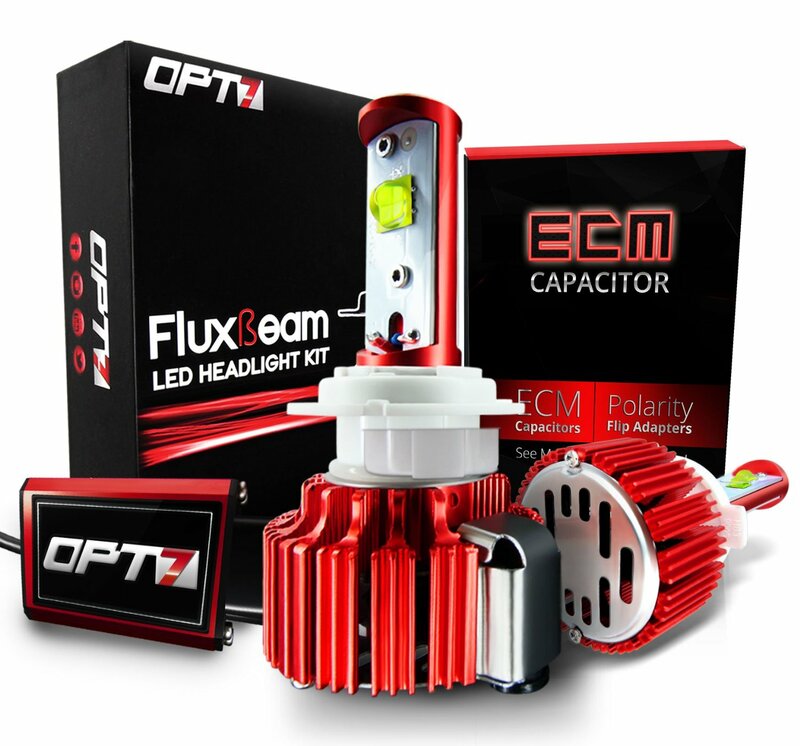 We won’t harp on about all the pros and cons of each headlight bulb technology today, but instead have left that decision up to you and have selected the two brightest headlight bulbs from each category to help you make a decision. We kick off this round-up with the winning technology of the past two decades, the HID or Xenon lightbulb. Kensun have been a leading supplier of low-price, high quality HID lights for many years now. With a new website, they’ve recommitted themselves to their promise of being number one in customer service. On display for our brightest HID bulb is their HID Xenon Conversion kit, featuring their tried and tested 35W premium ballast, prewired light bulbs with grommet and mounting brackets, all coming together in their neat aluminum carry case. Although many people will opt for the new slim ballast that Kensun offer, the premium ballast, while being slightly larger, has been a flagship product for several years, and is rated to last ten times longer than a standard halogen bulb. With a full offering of colors, you’ll be sure to find one to matches your requirements, or desires, but take note, from a legal perspective your lights have to be in the ‘white’ spectrum. It’s a fairly wide range, which will include lights which are both yellower and whiter than a plain white light. If you choose something extreme to drive around with, like pink lights, you’ll most likely get pulled over. This kit has been on sale for quite a while, and as such has had the opportunity to rack up a lot of reviews. This is great to get an overall feeling of the quality of the bulb. 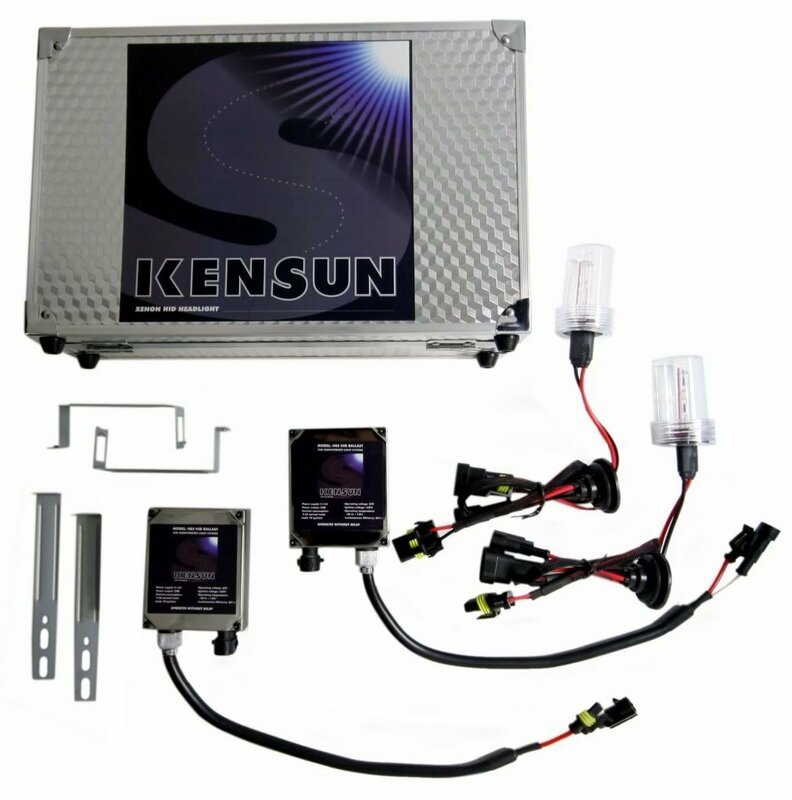 The kit is as simple to install as Kensun’s promises claim, although finding somewhere to mount the ballasts gets a bit trickier on smaller vehicles. From a brightness perspective, they are brilliant with some reviewers even claiming they outshone 110W halogens they had installed. Most people have also been impressed by Kensun’s customer service, true to their promise. Whenever there have been problems, either out of the box or within the warranty period, Kensun have been quick to respond and make provide support. A solid product from a dependable name. Brighter than most halogens, but perhaps not the brightest light bulb. From Kensun, we move on to Innovited. When they started out their products were very on par with offerings from Kensun, and they’ve continued to compete in the aftermarket headlight arena ever since, making sure not to compromise on quality. Based out of Illinois, they have warehouses throughout the US and abroad. The kit we’ve look at today features Innovited’s much newer, 55W rated, slim ballast. It’s almost half the thickness of previous ballasts, coming in at less than an inch (~20mm). This makes it even easier to install than previously, especially for owners with a smaller car. It’s also a 55W ballast which does result in a slightly brighter light than the 35W, but with that comes an expected decrease in lifetime. Innovited rate this kit to 5,500 hours though, but you will note dimming over time, and though the bulb might last 5,500 hours, you may decide that a replacement is required earlier. This is not a major problem though, as a replacement bulb does not require a replacement ballast, so you can continue to use that through multiple bulbs. Don’t be afraid that you’ll be replacing these every few months though. You should still get at least two years of bright light before a replacement would be considered. This slim ballast product is two years newer than Kensun’s premium package, and as discussed, garners some benefits from this. It’s still enough time to allow for a hefty number of sales though, and gives us a good overview of what people think. The biggest talking point is the low price for such a good quality product. Ballasts and wiring are all durable and well connected, and include suitable gaskets to ensure no water ingress. People do caution that the 55W power draw may be more than what some cars are designed to handle. You thus require an extra wiring and relay assembly, or you risk damaging the car’s electronics. If this is the case with your setup, you’ll have to fork out a little extra to get the lights working. 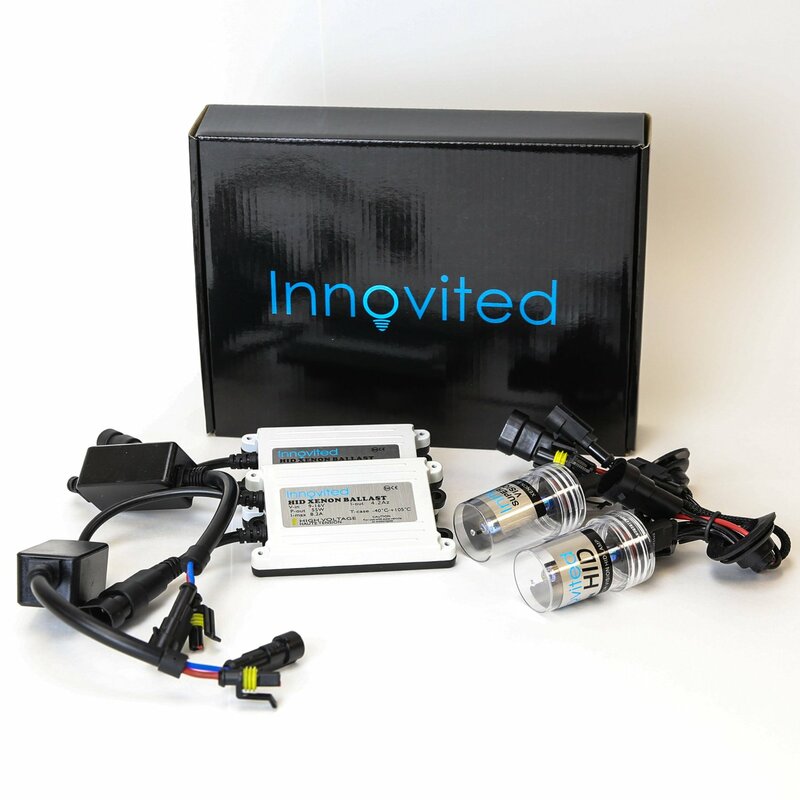 If you don’t need such an assembly, then we recommend the Innovited HID Xenon Conversion Kit with Slim Ballast as the brightest HID kit. To newer, and arguably better, things. 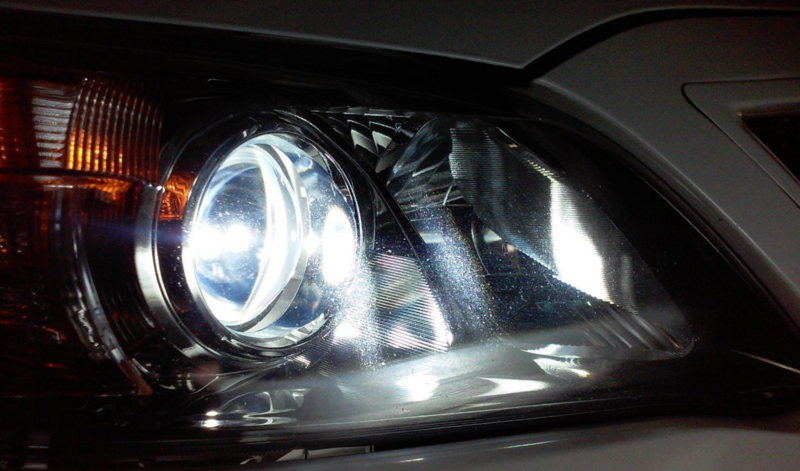 Let’s have a closer look at our top choice for brightest LED headlights this year. LEDs are in their prime development zone at the moment, with new and better products being released every year. JDM Astar are much newer to the arena than the rest of today’s contenders, but that shouldn’t discount them. They’ve placed all their focus on LED development, and this California based retailer has done a lot of work to catch-up. 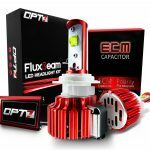 The work has paid off though as they offer one of the widest selections of LED lighting products in the automotive sector, supported by a new breed of loyal customers. 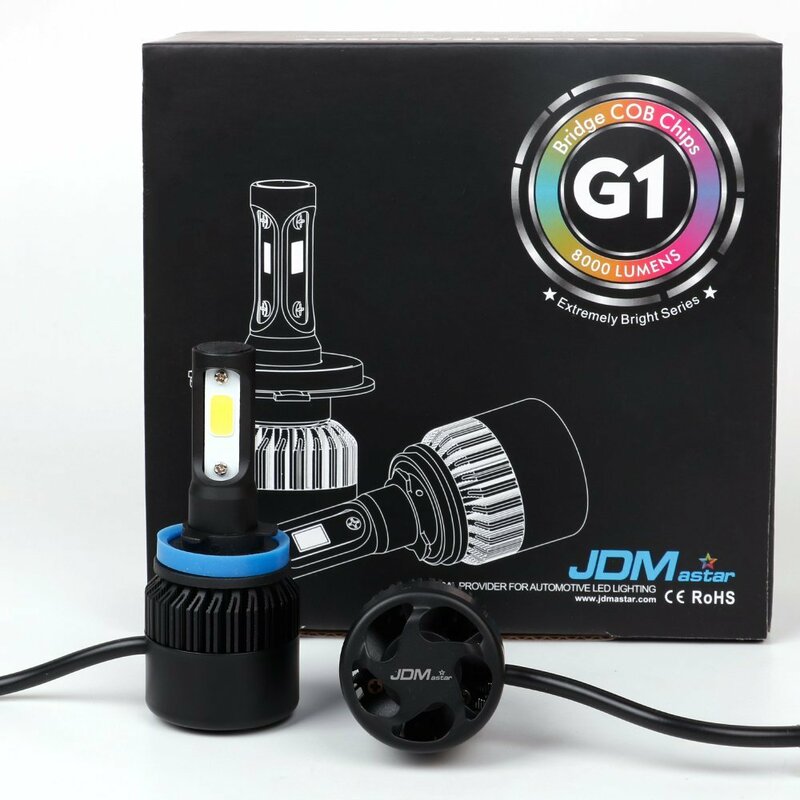 The G1 range of products are based on the latest COB LEDs. Featuring a completely integrated design, the driver and all cooling has been packed into the lightbulb. This negates the concern of extra electronics being damaged by moving parts in your engine bay. The cooling system, containing fan and electronics, does still protrude out the back of the bulbs, requiring more space than a conventional halogen, but should fit most cars. At 4,000 lumens, it is the product on today’s listing with the highest specified light output, and customers are not shy to support those claims. While JDM Astar do note that some cars, specifically from Europe, may require an additional anti-flicker relay harness, most customers did not mention that in their reviews. The lack of external driver makes installation easy and on pure brightness, it wins. We discussed brightness and other topics earlier, and there’s a chance that as bright as these lightbulbs are, with your car’s particular setup, you might not get the down the road lighting you had hoped for. If possible, try find a comment by someone with the same car as you and check their response. 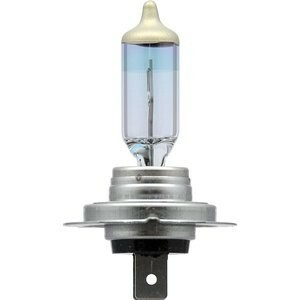 Otherwise, with some effort, you should be able to adjust these bulbs to provide the right distribution. Definitely the brightest bulb on our list, and at a very reasonable price. Results do vary though depending on your car’s particular geometry, so you’re not guaranteed the best experience. Opt7 are also a California based lighting company. With more experience in the industry than any of our other HID or LED suppliers, they’ve been a long way, and are known for their high-quality products. 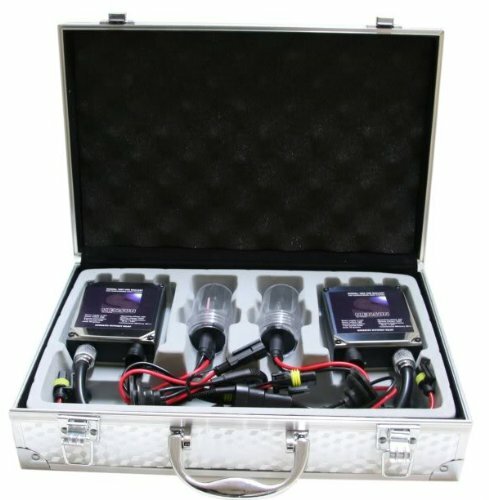 This Arc-Beam LED kit was one of their first products now with an updated, smaller driver. Although their driver is an external component, it does also include necessary electronics so that the bulbs are CANBus-Ready. While double the price of the JDM Astar G1s, the Opt7s come with a number of benefits. Besides what has been mentioned they also feature a 2-year warranty, with 50,000 hour expected lifespan. This product does however face a similar challenge to the mentioned issue with the JDM Astars. They definitely outshine the competition from a sheer brightness perspective, but there are also complaints of poor light distribution. We’ve always been impressed with Opt7, and this is a great product. Not as bright as the JDM Astar, and with a higher price tag, it’s not our first choice, but if you’re happy to pay for quality, definitely try them out. Last on today’s agenda is the trusty halogen. 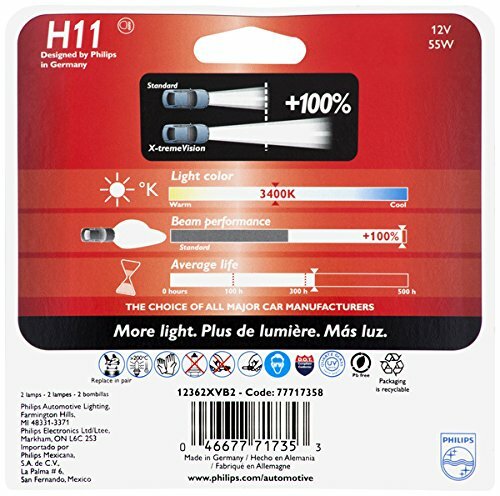 The most prevalent lighting source in cars today, and every day since cars were invented, top performing halogens offer the brightest DOT and SAE compliant lighting experience for any car. We talked about the heritage of earlier companies with their impressive decades, but when it comes to halogens, we jump up to the century mark. With over a hundred years of experience in the lighting industry, Philips know what they’re doing. Halogens are simple, they are straightforward and they work. 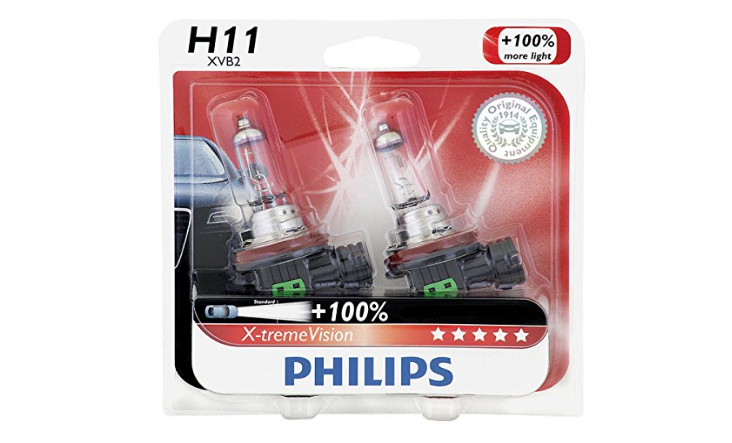 You get a slightly whiter light than a standard halogen, but a much brighter one, with double the down the road visibility available to you. Many of the people who were disappointed with the product complained the bulbs didn’t fit, this shouldn’t be a problem if you determine the bulb you require initially. However, some customers commented that the lights did not live up to their double the brightness statement, although acknowledging they were brighter than stock. 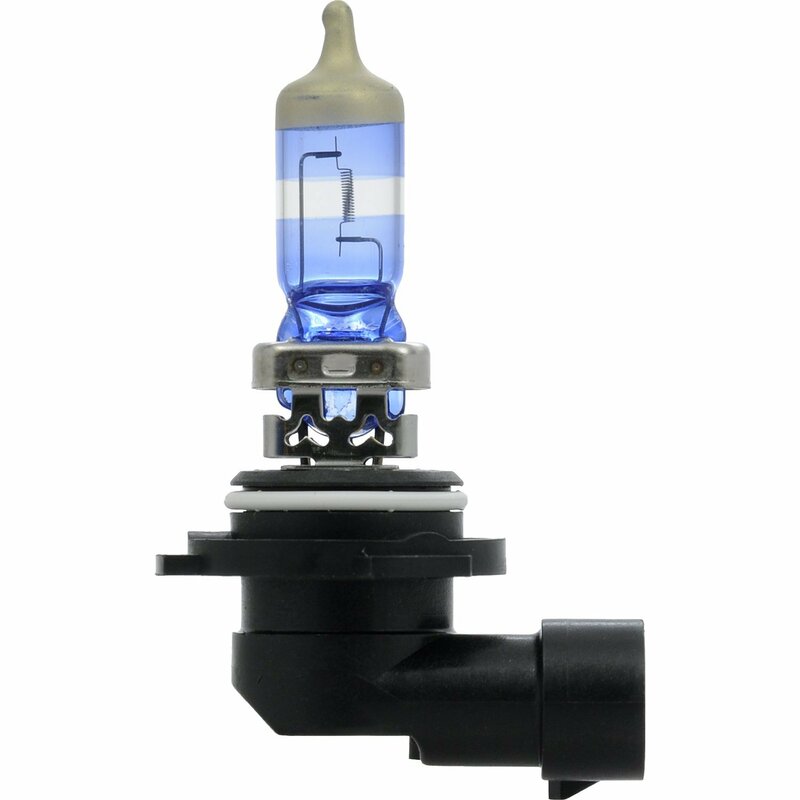 A very favorable product, the 300+ hour lifetime in this product category keeps it in our list of best headlights, but not at the top of brightest. 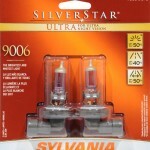 And then on to Sylvania, or Osram, depending who you’re speaking to. Another company with over a hundred years of experience, their SilverStar Ultra sits at the top of their product lineup, offering a color temperature just short of 4,000 K, it is a much whiter light than the Philips. While some people attest that the blue filter on the bulbs that creates the white light compromises the brightness of the light bulb, the design of the components allows it to still be our brightest halogen light, although lifetime is affected. The biggest complaint from customers is the short lifespan of the bulbs, with many attesting to less than a year of driving with them. 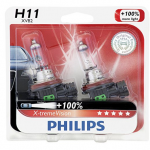 Buyers take note though: in the H11 form (used for this article), this bulb is cheaper than the Philips, and the obvious choice. All of a sudden making the Philips more appealing. Always do a price comparison before making a purchase. So brightness isn’t as straightforward as we would have hoped. 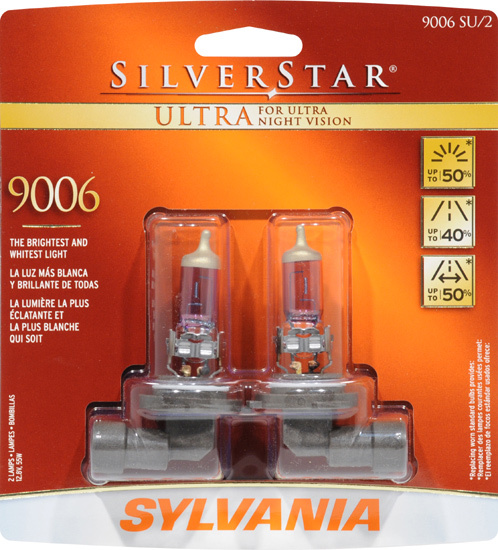 If you want excellent brightness, guaranteed to work without any issues, you can’t beat halogens, with the Sylvania taking the brightest bulb trophy. 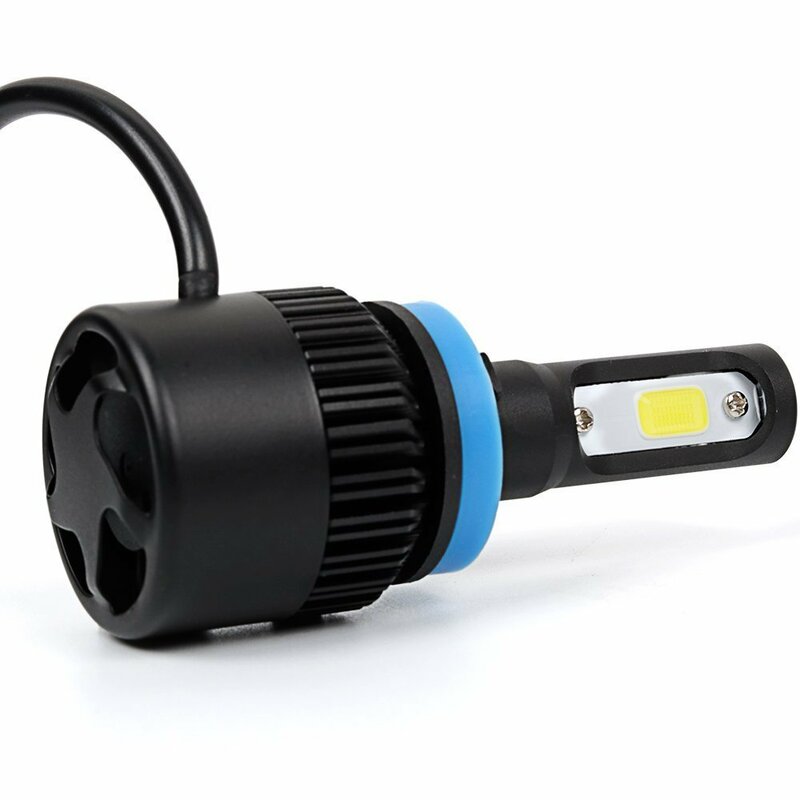 If that doesn’t satiate your desire for light, then into the world of HIDs and LEDs you will dive, but take note of different people’s experiences with each bulb.